Hourigan & Co. author’s self-help book at the Golden Globes - Hourigan & Co.
Today self-help author Dr. Vesna Grubacevic let us know that her book Stop Sabotaging Your Confidence was recently presented to Golden Globe Awards attendees as the only book included in this year’s gift bag. We helped Dr. Grubacevic publish the book in 2014, doing the interior layout, design commissioning, and print and electronic publishing for her, as well as coaching her through the independent publishing process for the first time. You can read more about the gift bag inclusion in Vesna’s article on her own website. 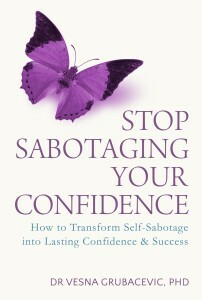 This marketing achievement, which sees the book put into the hands of major Hollywood stars, is a great milestone for Grubacevic, whose book is an outstanding, easy-to-follow guide to improving self-confidence by eliminating common self-sabotaging behaviors and thought patterns, based on solid research and proven methods. As you can imagine, we’re very excited for Vesna and can’t wait to her how her book continues to perform on the world stage. If you’d like to know more about how we can help you follow in Vesna’s footsteps and achieve your dreams of becoming a published author, don’t hesitate to get in touch.